Home Catriona Gray Miss Universe Catriona Gray, A Possible Host Delegate for Miss Universe 2018? Catriona Gray, A Possible Host Delegate for Miss Universe 2018? Newly-crowned Miss Universe Philippines 2018 Catriona Gray spoke out on the possibility of the Philippines hosting Miss Universe pageant again. During Bb. 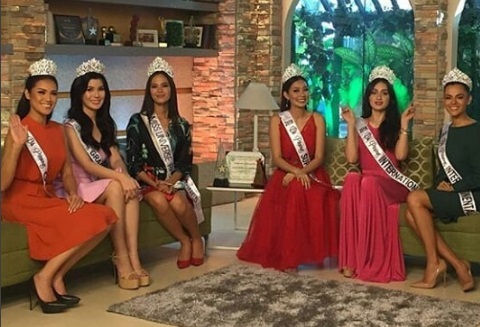 Pilipinas 2018 winners' guesting on Umagang Kay Ganda on Tuesday, the 24-year-old Bicolana beauty said that there have been talks of Miss Universe 2018 being held in the Philippines again. Meanwhile, other Binibining Pilipinas 2018 queens happily confirmed the dates and venues of their international competitions. Michele Gumabao said that Miss Globe will be held in August, while Cebu-beauty Eva Patalinjug confirmed that Miss Grand International 2018 will take place in Myanmar on October 25. Philippines' representative at Miss Supranational 2018 Jehza Huelar shared that there is also a possibility of hosting the international pageant in Cebu, Philippines or might be held again in Poland and Slovakia on December 1.